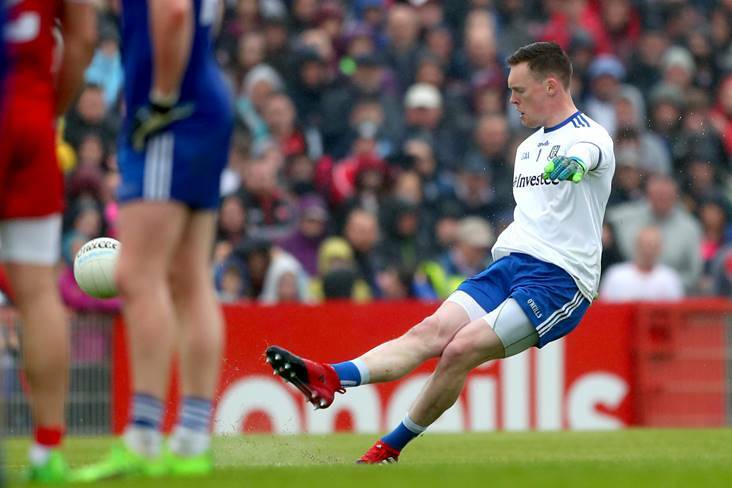 Monaghan goalkeeper Rory Beggan kicks a free. Former Antrim goalkeeper Chris Kerr reckons Rory Beggan could be out on his own as the best ‘keeper in the country at present. Drawing comparisons between the Monaghan no 1 and Dublin legend Stephen Cluxton, Kerr, who announced his inter-county retirement last week, feels that Beggan trumps the Parnells clubman because of the options the All-Ireland champions have out the field. “Beggan is right up there if not better than Cluxton now,” Kerr is quoted saying by The Irish News. “With the calibre of Dublin’s players it would be very hard not to perform especially the way they move for kick-outs and their athleticism. I’m not taking away from Cluxton – he is the best of all-time because he’s done it for so long. “But you have to look at Beggan’s frees against Kerry and Galway, and it’s his restarts that are just different gravy.